Our organization is an eminent name, which is engaged in delivering Process Dryer to the respectable clients. The offered range of process dryers is manufactured using premium grade components, sourced from dependable vendors of the market. In addition to this, the offered range of process dryers is checked on different characteristics so as to ensure its adherence with the benchmarks of quality. Agnee Engineering is a renowned manufacturer, supplier and exporter of heavy duty Industrial furnace & industrial ovens. Range offered by us is critically acclaimed for such qualities as competent performance, resilience, least maintenance, installation convenience and trouble free operation. Advanced technology & the premium raw materials that are employed in the manufacturing process are the contributory factors for the success of the product range. Some of the product categories offered by us are Annealing Furnace, Chamber Furnace, Conveyor Furnace, Non Ferrous Melting Furnace etc. We have invested heavily on a state-of-the-art infrastructural facility that allows us to carry out all our business operations with impunity. The manufacturing unit is outfitted with tools and machines that we source from most reliable names in the industry. The high technology that Machines are provisioned with features to accommodate modification & alterations to to bring about customization to address the divergent requirements of our extensive client base. R&D & quality monitoring are fundamental features of our business operations. Top notch product quality and product originality keep us on the upward trail. To meet ever expanding market demand we have build a ware house with advanced features. 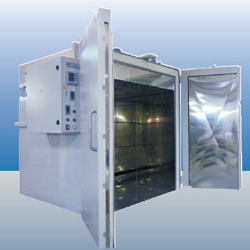 We are a leading manufacturers and exporters of Industrial Furnace & Industrial Ovens.